This article is about a specific region on The Center. For the entire map, see The Center. 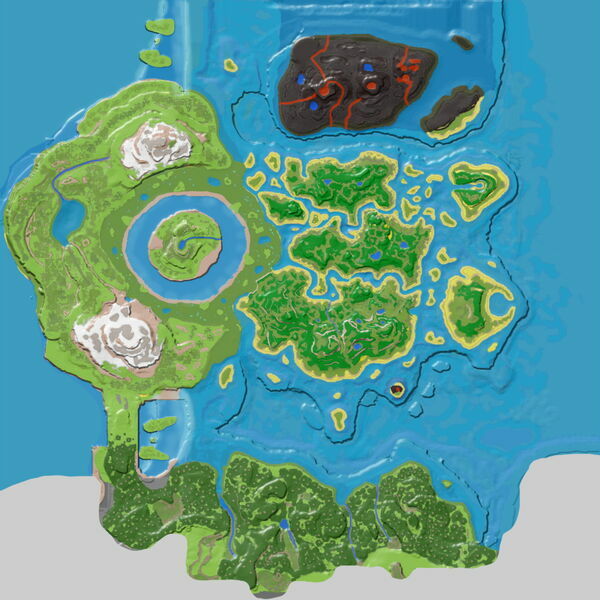 The Center Island or Floating Island is a massive, floating island to the West in the DLC: The Center. A gargantuan island like something out a science-fiction novel, and the namesake of the DLC, The Center floats majestically over a landlocked ocean, the Cauldron, surrounded by roaring waterfalls and swamplands. The Cauldron is home to Megalodon and contains Oil and Pearls. The Center itself is very porous with its own cave system. Towering spires with rich Metal deposits dwarf the floating island and supply its endless waterfalls. A large pond home to numerous Castoroides rests in the middle. The imminent danger of falling is only exacerbated by the constant threat of territorial predators; survivors should always be cautious and never lower their guard. The cave system within is known as The Center Cave. Watch your step. Falling from here can mean death or a headache of a swim in a sea of Megalodons. Unlike the other caves, flyers can be ridden inside of The Center Cave by default. As of August 2017 on the PC version, the water under the Floating Island is considered "deep sea." Although it is populated by Basilosaurus, taming one will result in the animal dying within a few minutes, even if it is at the water's surface.